18th March 2005 will invariably remain in my mind as one of the cornerstones of our life spent together. It was just after day-break – and we beheld a beautiful sunrise as we stood tall on the summit of awesome Mount Kinabalu, some 13,510 ft.high. It was gratifying to be able to trek up at 65 together with my trekking partner and 72-year-old heart patient spouse, our 38-year-old son Ravinder and six-year-old grandson Sanjeev. That moment as we held each other in a freezing embrace, we secretly shared the indelible experience and reminded ourselves everything is possible on this Earth. Age is certainly no barrier! You have to put your mind and will to it! We seemed mute – the air was too thin, and certainly not the moment to expend priceless energy and limited oxygen. Our trekking days to mighty Mount Kinabalu began a year ago as a pre-trip to the Himalayan Everest Base Trek last October. We felt the only way to assault the apparently formidable peak of South East Asia’s highest mountain was to have proper training. So, I courageously plotted out a training programme. Our plan was simple though the training was not! Weekly, we climbed the arduous 372 steps of Batu Caves, Bukit Kiara hills and rough terrain in the forest, and, Gasing Hill in Petaling Jaya. We were to climb Gunung Kinabalu end August 2004! August soon arrived and the excitement increased. My husband and I talked endlessly of this climb to our sons, Ajeet and Ravinder, and our grandchildren. We made all the reservations via a Sabah agent, insisting on a heated room. We packed food, a first-aid kit, lots of ponstan and diamox (for AMS), our warm jackets, woollen socks, gloves, cap, and scarves. We felt prepared mentally and physically. Arriving at Kinabalu Park, we checked into a lodge for the night to acclimatize ourselves. 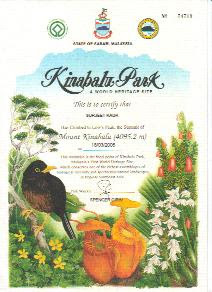 Next morning, we registered ourselves at the Kinabalu Park Office, got our name tags, a guide, and a porter. We were each then given an important document to read before moving to Timpohan Gate – the starting point. The very first sentence alarmed me. I took a glimpse of it, and secretly gazing at my spouse (not knowing he too was given a similar document) hid it from his sight. It created doubts in my mind. It was a dampener. The thought ‘Why wasn’t it sent to me much earlier?’ came racing into my mind. Soon we were off. Our trek to Laban Rata – some 11,000 ft had begun. We met trekkers from all over the globe. You must not climb this mountain if you are a heart patient distracted me. I felt chained and certainly apprehensive. I had to cast such negative thoughts out of my mind. I knew I was now concealing a secret from my husband. I wasn’t going to tell him what was impeding my movement. Suddenly as we neared Station Layang-Layang, the fourth or fifth station (or pondok – a small wooden rest shelter) the cold wind almost blew us off our feet and we were drenched. I was literally trembling. Some teenagers were told “Baring! Baring cepat!” The chilly wind was incredibly too violent and dangerous. At Laban Rata, to our shock, we were given cold rooms further away from the main resthouse. What a disappointment, and we had no sleeping bags. Dismayed, we settled down quickly. The louvres in some of the windows were missing. We could hear the howling wind and the pelting of the rain on our windows as we tried to catch some much-needed sleep. As I heard the wind and felt chilly, sans quilts, the document tortured me. I looked at my spouse lying in bed and wondered whether it was a right move to attempt the Summit. The document had put fears in me. Six years ago, he had suffered a heart attack and had undergone a by-pass. Little did I know that he too was harbouring similar thoughts. I was only told later that he had hid that document from me too. With the velocity of the howling wind increasing, I knew it was unsafe for two senior citizens to attempt the Summit. It was certainly not the best weather for ordinary young climbers who were physically fit – what more for two seniors. Was it going to be a mistake? Would I ever regret this decision? What if something happened? Somehow, I managed to abandon negative thoughts. It was really cold and sleep was distant. With moping countenance and dejected faces, the Jagjeets turned back, secretly making a wish that the next year we would attempt again, but in a drier season. On our return, we immediately made reservations for the heated Buttercup room and fixed March 17, 2005 as the day we would re-attempt, ready for a renewed challenge! If you have a history of suffering from these ailments , it is highly recommended that you should refrain from climbing : hypertension, diabetes, palpitation, arthritis, heart disease, epileptic fits, obesity, chronic asthma, hepatitis, etc. Prepare yourself mentally as well as physically. You need relentless will-power, a fit body, ample stamina and persistent endurance. Commence regular physical training well in advance to be fit. Have a medical check-up, especially if you are a senior citizen, to ensure you are physically fit. Enrol yourself in a gym or do outdoor trekking, especially on steep slopes. If you are in the Klang Valley, climb the 372-Batu Cave steps several times. Once a month attempt a longer uphill trek: Bukit Angsi or Datuk Gunung Rembau in Negeri Sembilan, for stamina and endurance. Read about AMS – Acute Mountain Sickness. Invest in a good pair of trekking shoes – but these are only useful up to Laban Rata. From thereon to the summit, all you need is a cheap rubber-soled pair of sneakers available at Laban Rata Resthouse (for just a few ringgit in most shops of Kota Kinabalu. Seek the advice of any mountain climber in Sabah where to purchase it from). Travel light. You need to bring raincoat, warm clothing, windbreaker, drinking water (available at Laban Rata at a higher price), cap to protect from the sun’s rays as well as the cold, gloves, thick socks, a miner’s torch-light and spare batteries, basic toiletries, towel and other items of personal use, plastic bags to keep soiled clothes, high energy food such as energy bars, chocolate, nuts, raisins, glucose sweets, etc. Surf the Net and read about the different accounts from different climbers to get a lucid picture of the trek and climb. Choose from a range of package tours and accommodation. Write to: info@suterasanctuarylodges.com.my to make room reservations at Laban Rata Resthouse for heated rooms or heated dormitories months in advance. Old Man Nabalu has some fascinating power about him. The nearest I got to him was when I was playing golf at Kundasang. I could feel his power towering over me then.